This chapter could not possibly come at a better time for me, and it's ironic that I suspected this from the time we selected this book as our winter/springtime spiritual reading. Today's chapter is entitled: "On Rising - Starting Your Day Right," and let me tell you, I need me some solidly holy rising these days. So often, I have a Grump Face, accompanied by Grump Attitude for the entirety of my work day, and then in the evenings, I adopt Grump Face's BFF, Emotionally Drained Face. 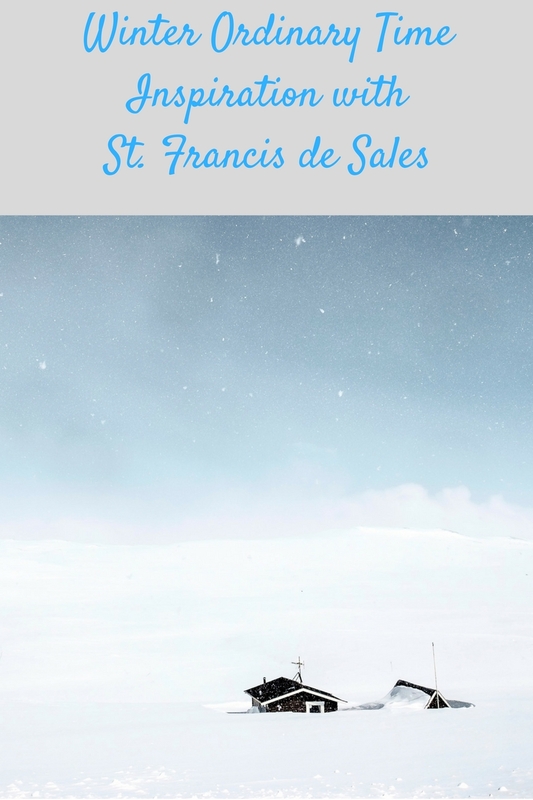 What does St. Francis de Sales have to say that can help us? "That we are alive for another day is the gift each morning brings...It may take some practice, but it will prove beneficial to make this the first thought of the day, instead of reacting with annoyance or reluctance at having been awakened." It may take some practice, you say? Why yes, yes, that is indeed the case. :0 And of course, HELLO Annoyance and Reluctance! You have have overstayed your welcome! "Although a seemingly benign beginning to the day, the act of getting out of bed represents for St. Francis de Sales the profound reality of the resurrection and that gift of life beyond death to which we are ultimately called." "I know that my Redeemer lives, and that on the last day I will rise again. My God, grant that this be to eternal glory; this hope rests in my inmost being." Job 19:25-26. "...sanctify these early moments of the day by means of thoughts and words already familiar to us." "All of this is intended to turn our morning routine into a sacred one. Routines play a key role in human life. Able to be done without our giving them much thought, they are comfortable, and often, comforting, acts. Psychologically, even if not consciously, they represent a way of exercising a modicum of control over the chaos of our surroundings." That really is key, isn't it? I may not be able to control everything that happens in my day. But I can control my happy little routine and the simple comfort and joy it gives me. If I hang on to that, I can hang on to my inner peace. "As we begin to dress, we will make the Sign of the Cross, and say - 'Cover me Lord, with the cloak of innocence and the robe of love. My God, do not let me appear before you stripped of god works.'" I love this idea. I know that religious have special prayers that they say as they put on each item of their Habit. Just because we're laypeople doesn't mean we can't do something similar in an effort to sanctify our days as well. What did you all think of Chapter 3? I love the idea of the first thought of the morning being about God. It makes perfect sense. And that line from Job. I love it too! Yes, the saints are my bff's. SUCH a comforting thought. I'm really pleased at how we decided to read this book, that it will span both winter Ordinary Time AND Lent. I'm thinking that closer to Ash Wednesday we can chat about starting to employ some of these tactics during Lent and see how it goes! What do you think? I think that's a great idea! A few small things could make a huge difference. I really enjoyed chapter 3. In fact I read it twice. :) I found it encouraging that he advised simple and quick ways to turn our minds to God in the morning. It makes morning prayer seem more doable and not the big event I have often tried to make it. As I'm becoming better acquainted with St. Francis's teachings I'm seeing his inspiration in many places. A couple of weekends ago I could see his influence in the homily the priest gave although St. Francis was never mentioned so I don't know if the priest was intentionally referencing him. The priest mention the need to go slowly and not try to take on too much at once in our spiritual life. Specifically he said we should choose two beatitudes to try on work on, not try to work on all of them at once. He also made a comment similar to the one from this weeks chapter that rising in the morning is like the resurrection. This thought struck me and reading it (or hearing it again) is causing me to think more about it. It is a very interesting thought. The scripture verse you highlighted was one of my favorites. I could more easily identify with it that with the other verses quoted in that section. I had never thought of saying a prayer as I got dressed but I like the idea of turning an ordinary event like getting dressed into a prayer and I've been trying to make it a habit. I've been thinking about writing the prayer out and taping it to my closet to help me remember. I also really liked this quote from the introduction to part 2. "While seemingly simple and easy to do, keeping holy thoughts is a practice whose value cannot be underestimated. In fact, St. Francis de Sales considers the use of prayerful aspirations as something absolutely essential to leading a devout life." Absolutely LOVE that idea about selecting 2 Beatitudes! I just mentioned to Sam above that we should pick a few things\inspiration from the book to employ during Lent. What do you think? And yes, I've been pretty much taping these verses to my forehead. ;-) I have the Prayer of St. Francis de Sales from Tuesday's post taped up to the back of my door at work where I hang up and retrieve my coat each day, and I tore the photo of St. Francis from January's Magnificat out and put it up on my bulletin board. Nice little reminders! I like the idea of picking a few things from the book to focus on during lent. I must admit that I never picked two Beatitudes to work on. However, one of the things I like about the book is that its suggestions are more specific, e.g. praying when you get dressed is a good thing and here is a sample prayer for you. I love the prayer "Cover me Lord with the cloak of innocence and the robe of love." Amen! Spiritual GPS...I absolutely LOVE this! :0 Yes, it, really, REALLY does color the rest of the day! My work days have been worlds better since I started adopting this mindset! I really like the idea of prayer as a way to recalculate our spiritual GPS.